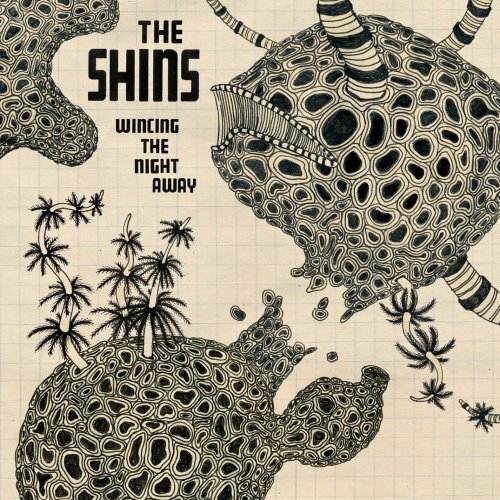 Wincing the Night Away is a Grammy-nominated album by indie rock group The Shins. It was released by Sub Pop Records on January 23, 2007. It is the band's third album, and the final under their contract with Sub Pop. The album was recorded in James Mercer's basement studio, Phil Ekâ€™s home in Seattle, and in Oregon City with veteran producer Joe Chiccarelli (Beck, U2). Producer Chiccareli had become aquainted with Mercer while in Portland, Oregon, working with Pink Martini. At the time Mercer was recording the new Shins album on his own and finding that it wasn't going the way he wanted and at the speed he wanted. Frustrated and in need of fresh objective feedback he sought Chiccarelli's advice and suggestions, before the producer eventually became involved in a professional capacity. The duo didn't start the record from scratch; while they started some songs completely anew, they also retained some of the material that Mercer had been recording on his own. According to Chiccarelli in an interview with HitQuarters, the duo spent around two months working together on the album. The title is a play on the name of a Sam Cooke song, "Twistin' the Night Away". As reported in Rolling Stone magazine, it is a reference to band member James Mercer's "crippling insomnia". "Sleeping Lessons", the title of the first track, also references insomnia and was considered as a possible album title. Prior to the album's release, Mercer confirmed Wincing the Night Away as the album title in an August 2006 interview with Billboard. The full track listing was announced by Pitchfork Media on October 16, 2006. The first single, "Phantom Limb", was released on iTunes on November 14, 2006 and reached physical retailers on November 21. The new album was previewed in its entirety on the band's MySpace. The album was leaked from a promo copy on October 20, 2006. Sub Pop responded by hiring a UK company to track down the source of the leak. On January 9, 2007, iTunes accidentally put the album on sale two weeks before its official release, then removed the option to purchase a day later. It is unknown how many people purchased the album within these two days. Sub Pop Records also released the album as a vinyl LP, which includes a free coupon to download the album in mp3 format. Wincing the Night Away debuted at number 2 on the Billboard 200 chart, selling in excess of 100,000 copies. This is the highest chart position reached by not only The Shins, but the whole Sub Pop label as well. During the same week, it also appeared as the top album in four other category charts: Top Digital Albums, Top Rock Albums, Tastemakers, and Top Independent Albums. In the album's second week on the Billboard 200, it fell to number eight and sold about 53,000 copies.Jonathan Cohen, , Billboard.com, February 7, 2007. Like Oh, Inverted World, the album went Gold. Mercer stated that the band was "stretching out" on the new album, and that the extended recording period had given them more time to develop their ideas. He hoped to address more of the "human condition" on the third album, even though it is subdermally present in the previous two albums as well. Wincing the Night Away is The Shins' most musically diverse and experimental album yet, ranging from hip-hop loops to psychedelic to Hawaiian folk to New Wave and post-punk elements. According to review aggregator Metacritic, Wincing the Night Away is rated slightly lower on average than its predecessor, Chutes Too Narrow. However, the more positive reviews still praise the album highly. For example, the Austin Chronicle says that Wincing "makes both albums sound like fragmented potential". The New Musical Express states that the album is "their best yet". More negative reviews came from Dusted Magazine, which said "this is music that not only is mature enough to know that it can't change the world, but is content to not try", while Village Voice said "filler tunes like "Pam Berry" and "Black Wave" are a far cry from the tenacious stuff that made Chutes the subject of lavish hyperbole"
*Chris Funk â€“ lap steel on "Red Rabbits" and "A Comet Appears", hammered dulcimer and bouzouki on "A Comet Appears"
*Eric Johnson â€“ backing vocals and piano on "Girl Sailor"
*Anita Robinson â€“ backing vocals on "Phantom Limb" and "Turn On Me"
*Paloma Griffin â€“ violin on "Red Rabbits"
*Niels Gallaway â€“ French horn on "A Comet Appears"
*Additional assistance by Jason McGerr, Marisa Kula, Chris Jones, Bob Stark, Brian Lowe, Brian Vibberts, Kendra Lynn, Wes Johnson & Pete Tewes. The Shins began in 1997 as a side project for singer/songwriter James Mercer, whose primary band was Flake Music in Albuquerque, New Mexico. Mercer formed Flake Music in 1992 with Neal Langford on guitar, Marty Crandall on bass, and Jesse Sandoval on drums. During the next 5 years Flake Music released several singles, a full-length album, and began touring largely due to the help of other bands like Modest Mouse. In 1997, Mercer began writing songs that would eventually become the now classic first Shins single "Nature Bears A Vacuum". Around this time Flake Music had come to an end, which left The Shins with an opportunity to record their work. Recruiting Sandoval to play drums, Nature Bears A Vacuum was released with low expectations for being popular beyond Albuquerque. The Shins first few appearances originally featured only Sandoval and Mercer. However, the released single attracted enough attention for a full band to form. Crandall was brought into the fold on keyboards, and band friend Dave Hernandez (frontman of local punk legends Scared of Chaka, which had played dozens of shows with Flake Music) was given bass duties. At a San Francisco performance with Modest Mouse in 2000, Sub Pop's Jonathan Poneman asked The Shins to contribute a single to the label's Single of the Month Club, which eventually became an offer to release The Shins' 2001 single, "New Slang", and their debut album, "Oh, Inverted World". The group spent the rest of the year touring. The release of singles such as "Know Your Onion!" and "The Past and Pending" kept The Shins' success going into 2002, cementing "Oh, Inverted World" as one of the definitive indie-rock albums of the early '00s and The Shins as one of the genre's leading younger bands. It received critical acclaim for its lyrically deft and jangly pop sound. The song "One By One All Day" was featured in the 2003 film A Guy Thing, starring Jason Lee. Two other songs from this album, ("Caring Is Creepy" and "New Slang") were featured prominently on the soundtrack for the 2004 film Garden State, starring and directed by Zach Braff, exposing the music of The Shins to a much wider audience. Exclaim.ca Their music was also featured in the television series The OC, the film The Spongebob Squarepants Movie and they performed on an episode of Gilmore Girls. Oh, Inverted World appeared at #71 on Pitchfork Media's Top 100 Albums of 2000â€“2004. Relocating from Albuquerque to Portland, OR in 2002, Mercer and Sandoval (as well as Crandall, working with the band from Albuquerque) lost Langford to his true passion, professional hot air ballooning. Dave Hernandez (at this point living in nearby Seattle) rejoined The Shins in 2003 playing guitar and bass. The band began tracking new material in Mercer's basement that summer. In an effort to balance the home-recording method used on Oh, Inverted World with a studio finish, producer Phil Ek (Built To Spill, Modest Mouse) was brought in to mix and produce the album. Chutes Too Narrow was released by Sub Pop in the fall of 2003 to much fanfare in indie music circles, featuring even more multi-layered lyrics, as well as a musical approach that explored new genres, song structures, and levels of production fidelity. In 2006, the band helped to curate an edition of the British All Tomorrow's Parties festival. Nonstop touring of everywhere from Australia to Norway, as well as the US countless times over contributed to pushing sales past 500,000 worldwide, exceeding everyone's expectations, including the band's. Chutes Too Narrow appeared at #47 on Pitchfork Media's Top 100 Albums of 2000â€“2004. An enhanced single release in 2004 included a live version of "New Slang" recorded with Iron and Wine, a studio mix of "Fighting in a Sack," a multimedia tack of "So Says I," and a cover of the Marc Bolan song "Baby Boomerang". The Shins have also recorded a cover of "We Will Become Silhouettes" by The Postal Service, which was released on that group's 2003 single "Such Great Heights". On June 20, 2008, the band announced that they were leaving Sub Pop Records for James Mercer's own label, Aural Apothecary. According to an interview published on Pitchfork Media on May 6, 2009, "keyboardist Marty Crandall and drummer Jesse Sandoval had been replaced by Ron Lewis from Grand Archives and Fruit Bats on bass and Joe Plummer of Modest Mouse on drums". In the same interview, Mercer said the next record "is still in its very early stages" and that he's "aiming for a release early next year". Regarding the lineup change, he commented that "I started to have production ideas that basically required some other people", but that he "wouldn't say I'd never work with them again". On August 10, 2009, in a lengthy interview published in The Portland Mercury, former drummer Jesse Sandoval claimed that his departure from the band was not due to "aesthetic differences", but rather that he was fired, saying, "I understand he's probably doing it out of respect for me reading interviews, it might be hard for him to say it, but... I got fired. There's no other way of looking at it. ", Interview with Jesse Sandoval. On January 18, 2010, The Quietus revealed that Mercer is taking a break from The Shins until at least 2011. *Music from Scrubs (soundtrack) (2002 Â· Hollywood Records) song: "New Slang"
*Garden State (soundtrack) (2004 Â· Sony Records) songs: "Caring Is Creepy", "New Slang"
*Wicker Park (soundtrack) (2004 Â· Lakeshore Records) song: "When I Goose-Step"
*The SpongeBob SquarePants Movie (soundtrack) (2004 Â· Sire/Warner Bros. Records) song: "They'll Soon Discover"
*Live at KEXP, Volume 1 (compilation) (2005 - KEXP) song: "Kissing the Lipless"
*Our Little Corner of the World: Music from Gilmore Girls (soundtrack) (2002 Â· Rhino Records) song: "Know Your Onion!" *Sprout (soundtrack) (2005 - Brushfire Records) song: "When I Goose Step"
*"Causes 1" (compilation) (2007 - Waxploitation) song: "Turn On Me (Clint Mansell Remix)"
*The Saturday Sessions: The Dermot O'Leary Show (2007) - "Breathe"
*Chuck (Episode 1 Season 1\TV series 2008) "A Comet Appears" plays while Chuck and Sarah sit on the beach. *"Music from Weeds" (soundtrack) (2008 Â· Lions Gate Entertainment) song: "Little Boxes"
*Yo Gabba Gabba! Music is Awesome! (2009) song: "It's Okay, Try Again"
This song also appears in the 2001 Transworld Skateboard video, "Sight Unseen".